It isn’t long after daybreak when Bama and I find ourselves in a small slice of Europe. Across the tree-lined street, not yet spoiled by the din of motorcycle traffic, the painted copper dome of a church glints in the first rays of the morning sun. Around us rise noble structures in brick and stone, some crowned with the narrow, steep-sided gables of a country halfway across the world. Semarang has one of the best-preserved historic centres of any major city in Indonesia, and we are standing at its very heart. 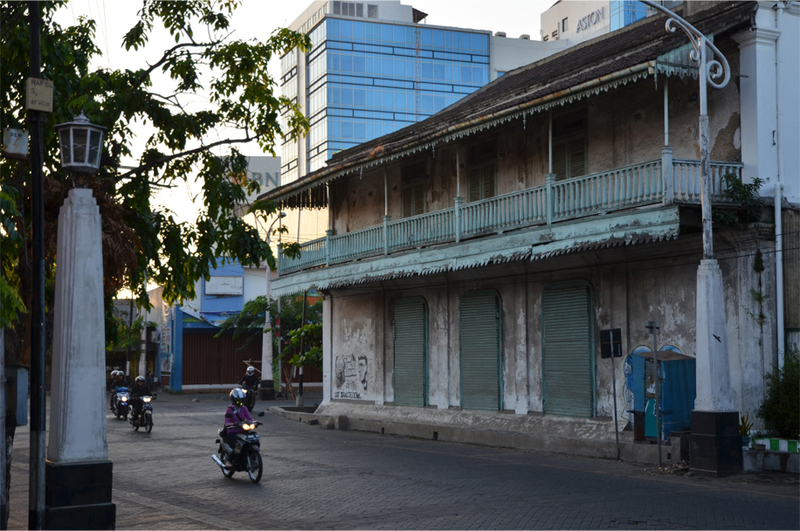 The genesis of the old town can be traced to 1678, when the Javanese Sultanate of Mataram gave the area to the Dutch East India Company, the formidable VOC. In the space of a decade the Dutch began building a riverside fortress named De Vijfhoek, ‘The Pentagon’, its five corners fitted out with sturdy, projecting bastions. 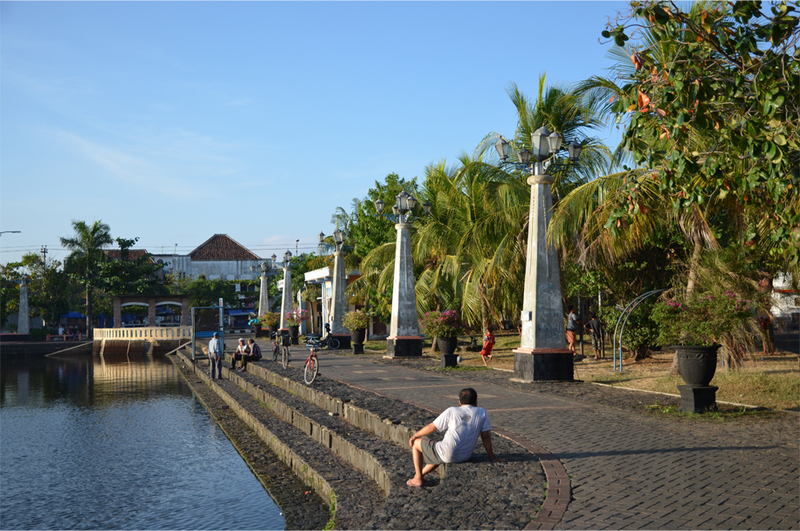 The fort controlled Semarang’s access to the sea – anyone sailing upriver to the bazaar would have to pass under the cannons of the VOC. The Dutch were notoriously brutal in their colonisation of Indonesia. In October 1740, prompted by the killing of 50 Dutch soldiers by a mob of Chinese labourers, the authorities retaliated with two weeks of uncontrolled bloodshed. 10,000 ethnic Chinese were massacred within the city walls of Batavia (present-day Jakarta) alone, and the survivors fled east to the Sultanate of Mataram, organising themselves in a bid to foment an uprising against their European overlords. For a time the Javanese monarch, Pakubuwono II, complied with the VOC’s requests for assistance, but he tacitly supported the revolt. His soldiers staged mock battles with rebel forces to satisfy the Dutch commander, and he diverted manpower to a palace renovation project. Buoyed by the success of a Chinese army sweeping across the northern coastal region of Central Java, the ruler soon turned on the VOC. Several thousand Chinese troops had massed at the gates of Semarang, and 20,000 Javanese men would also take up arms. But the siege – and the wider rebellion – ended in defeat. Fearful of future attacks, the Dutch tore down their pentagonal fortress and enclosed Semarang by a wall two metres thick. The Javanese and Chinese communities were relegated to districts outside the battlements. What began as a fortified European enclave, centred on a town square and church, eventually developed into the core of a booming metropolis. 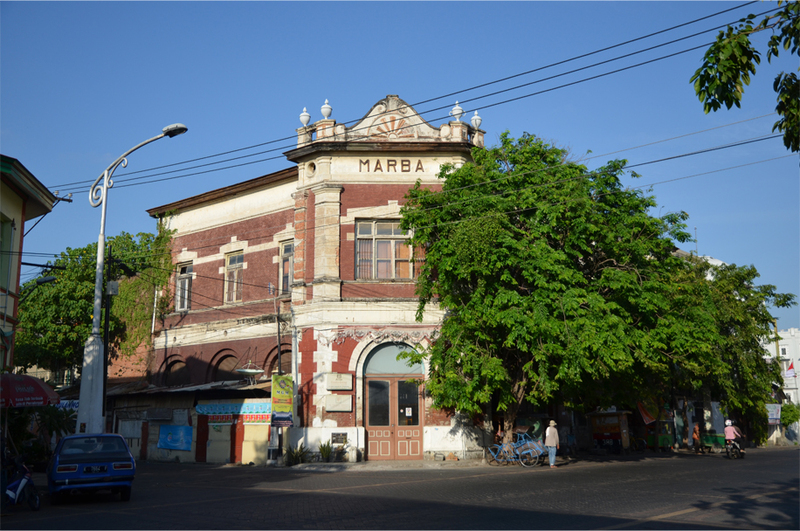 Semarang flourished on the commodities that grew in the fertile Javanese hinterland. Apart from rice and timber, the coastal region of Central Java was a major source of sugar for the VOC. Plantations in the interior supplied tobacco for export, and Javanese cloth from production centres to the south also made its way to the harbour. 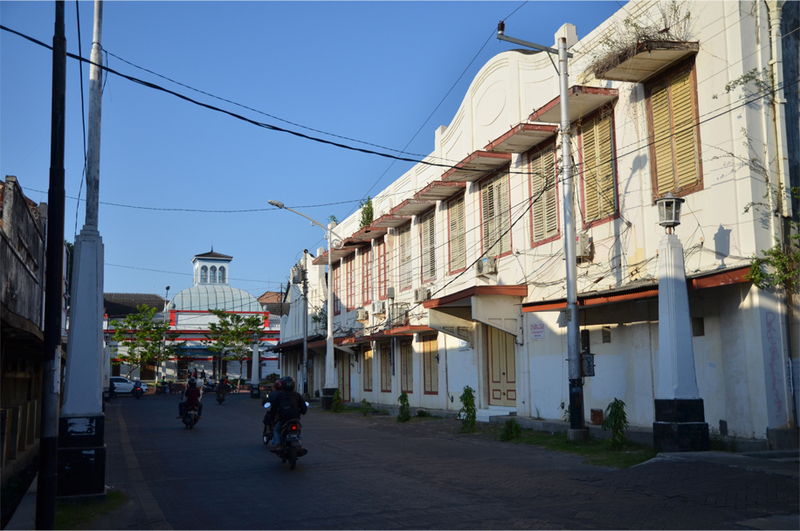 By 1775, the volume of trade passing through Semarang would make it the second-largest port in Java. Merchants from China, India and Arabia set up shop in the growing city, as did European settlers. In time, the character of the wealthy business district would lend it the nickname the ‘Little Netherlands’. 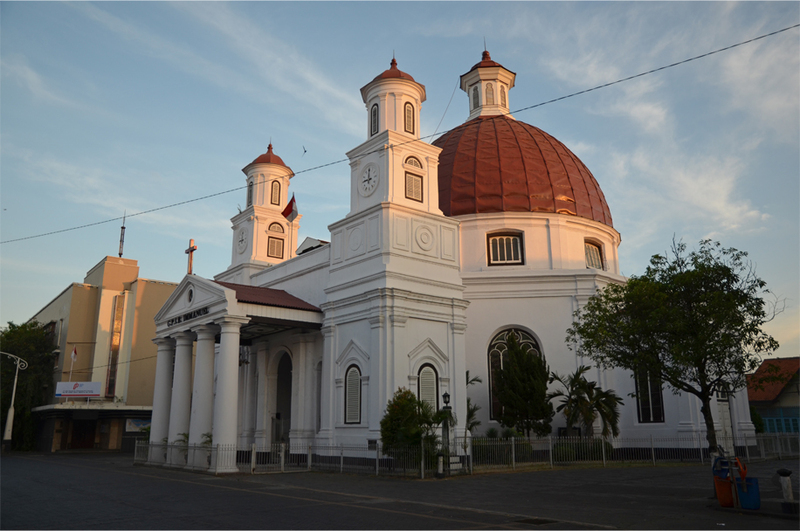 Dutch Protestants in the old town worshipped at Gereja Blenduk, named for its distinctive cupola (blenduk is Javanese for dome). 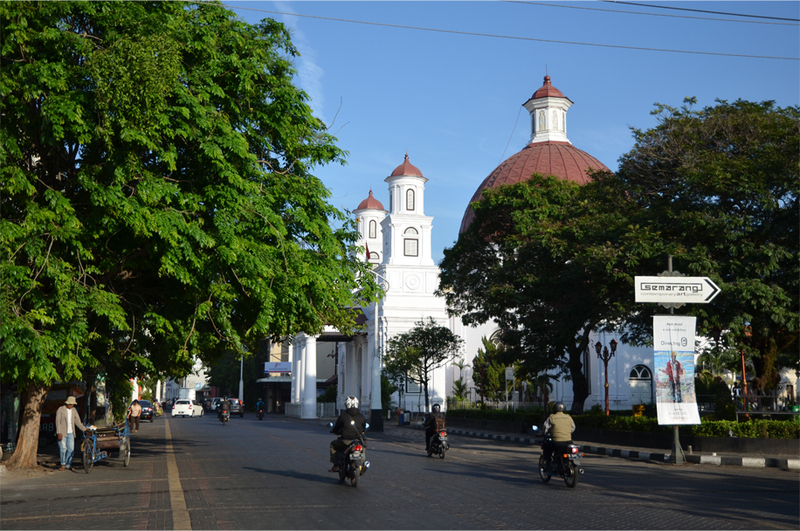 Although the church was founded in the middle of the 18th century – making it the oldest in Central Java – most of the present building dates from 1787. The signature dome and twin towers were added more than a hundred years later, in 1894. 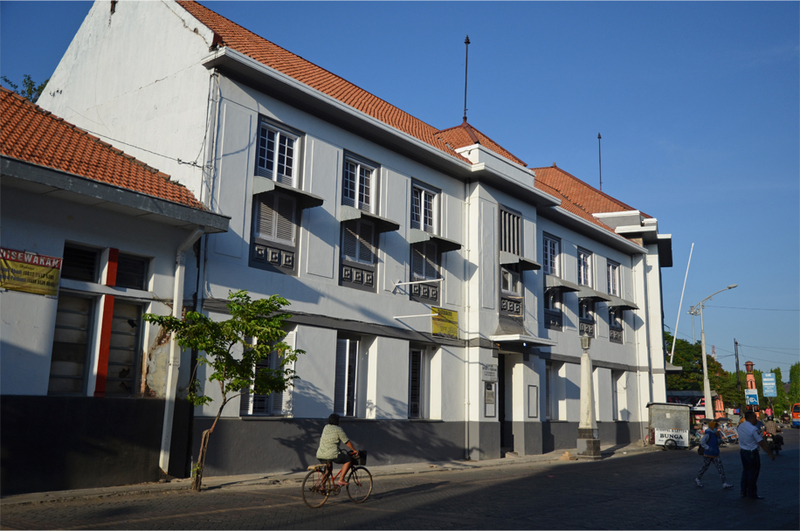 Opposite Gereja Blenduk, the Jiwasraya Building is Semarang’s monument to tropical Art Deco. 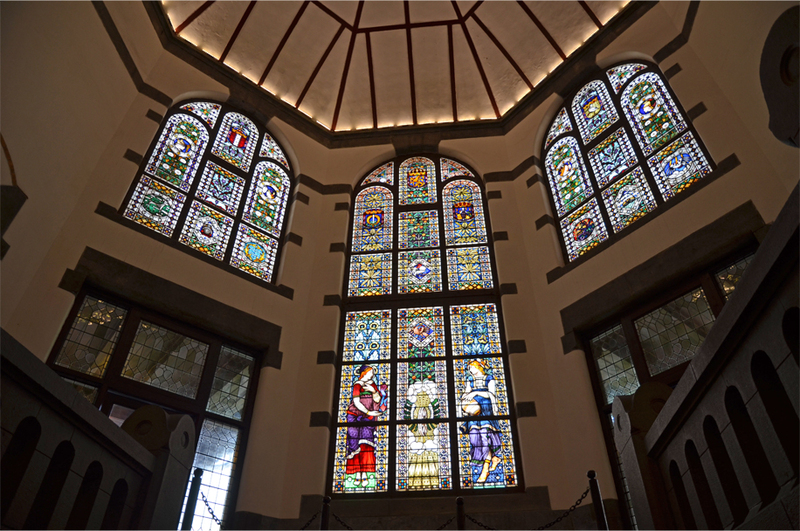 Equipped with the first elevator in Central Java, it was built in 1916 for the largest life insurance company in the Dutch East Indies. 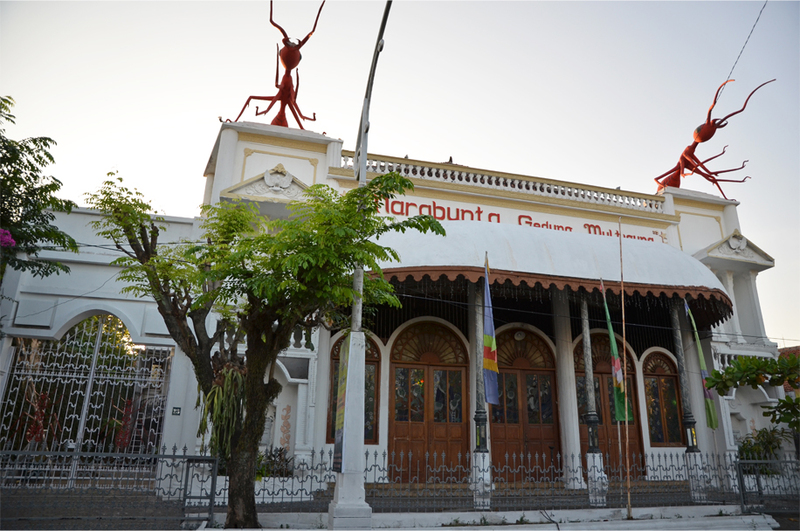 The whimsical Marabunta Building stands several blocks away, its front doors depicting Snow White and the seven dwarves in stained glass, while two enormous fire ants gaze out from the roof. The turn of the 20th century also saw the construction of Semarang’s most prominent landmark: Lawang Sewu, literally ‘A Thousand Doors’ in Javanese. Taking shape at a major roundabout outside the old city, it served as the headquarters of the Dutch East Indies Railway Company. The design employed New Indies Style, which fused Dutch Rationalist architecture with the practical needs of the tropics: covered galleries to shelter people from torrential rainfall and the harsh sun, hundreds of doors and windows to aid cross ventilation. After Indonesia gained full independence in 1949, the Little Netherlands experienced a gradual decline as the city centre shifted to the south. Recurring floods, exacerbated by ongoing land subsidence, spurred on the exodus of businesses from the district. But decades of neglect and flooding were a blessing in disguise – developers had little incentive to destroy its wealth of colonial architecture. Thank you for capture the Little Netherland James. It’s an interesting post. Your photos are great, and the article as well. I always enjoy to read your post, especially when you write the historical side of a place. 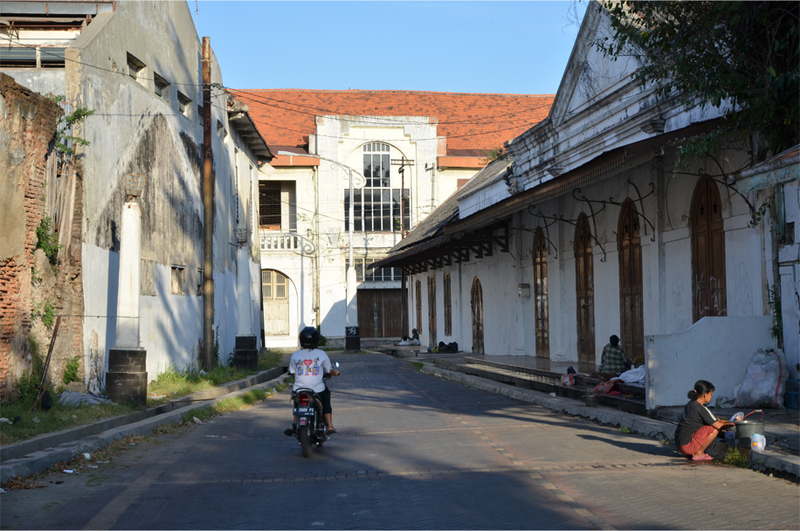 You’re so lucky to visit and see the Kota Tua Semarang now, since it is beautiful, more organize, and cleaner than ever. I remember when I was a child and lived in Semarang, this Kota Tua is a spooky area, in the rain season the street will turn into small canal. Flood often come, especially when the sea level raised up. It does seem like a bit of ironic luck that the old Dutch buildings survived because of the flooding in the area, and it is always cool to see old town restored and maintained. Were there very many tourists there? 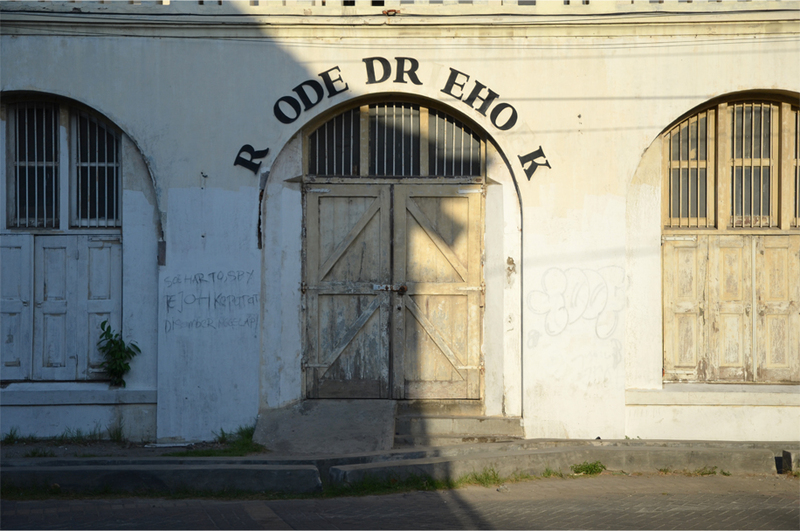 It seems like an obvious stop on a trans-Java trip but we never really thought about visiting. Funny thing is, there were no other tourists around. Could be partially down to the fact that Bama took me there first thing in the morning, but I also think Semarang is well off the general tourist trail. 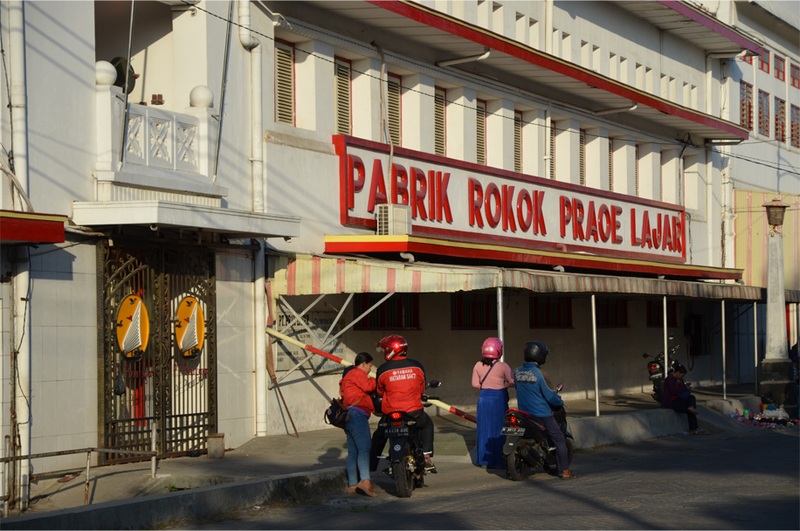 On the internet, the only stories I’ve read about the old town come from local news outlets and Indonesian bloggers. Harus pergi ke Kota Lama Semarang… bangunan-bangunan Belanda di sana indah banget! Great post, James. 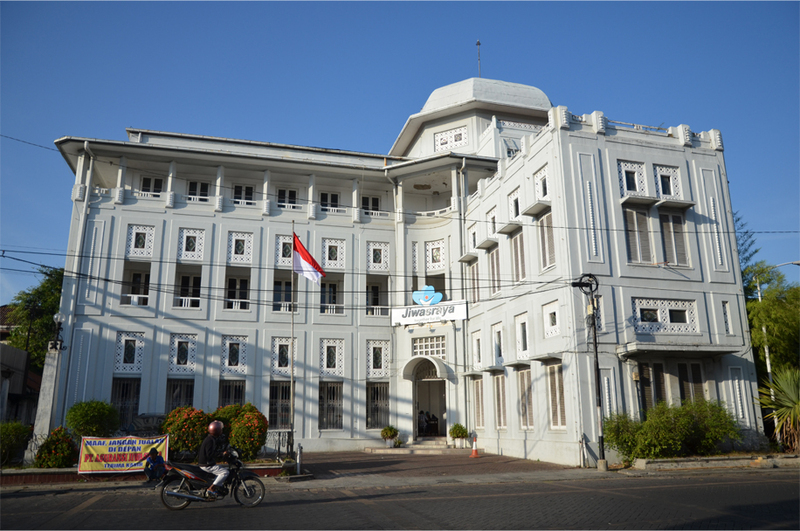 Seeing your photos and reading your history of Semarang are really helpful in understanding the Dutch influence in the region. Thank you, Kelly. Semarang has direct flights to Singapore (on SilkAir and AirAsia) so if you ever feel like visiting the next time you’re in the area, it’s not far at all! For such a tiny country, the seafaring Dutch influenced architecture in far corners of the globe. Here in South Africa there are plenty of examples of Cape Dutch architecture. Squint a little bit in central Cape Town and you could almost be in Amsterdam with tall thin gabled buildings. It sounds like the Netherlands and Portugal were very similar in that respect. I’d love to visit Cape Town someday – your mention of the Cape Dutch architecture there is yet another reason to plan a trip! We live in more frenetic Jo’burg, but Cape Town is stunning and should be on everybody’s bucket list. Your history of the area was a great read, well written and informative- thanks! These old colonial centres, around the world, are such interesting history. Great photos. You’re welcome! After visiting places like these, I wish Hong Kong had done more to protect its colonial architecture – we have lost so many of our best buildings since the 1970s. Thanks too for reading and commenting. Over the years I do see improvements in and around Kota Lama. In 2008 the reservoir in front of Tawang was very dirty with a really foul smell, many buildings were deserted and crumbling. Then a few years later some buildings were restored and the reservoir was cleaned. Then on my last visit with you a previously abandoned building near Gereja Blenduk was turned into a fancy cafe. It also helps that people’s awareness of the importance of preserving historic buildings has generally improved. That’s really good to hear, Bama! It will be so nice to see the old town become a desirable place again. I am sure new things await us the next time we visit… maybe we’ll even get to go inside Gereja Blenduk and some of the nearby historic buildings. Unfortunately, colonialists everywhere were out for themselves. I can’t get over how litter free the streets are. The place looks perfect. It wasn’t perfect of course – but I too was impressed with the cleanliness of the old town. Hopefully it will stay that way in the future. I always love well-maintained old buildings, and your pictures are gorgeous! Thank you for introducing Semarang to foreign travelers, Semarang needs more acknowledgement as it has many tourist attractions, specifically in social and culture. 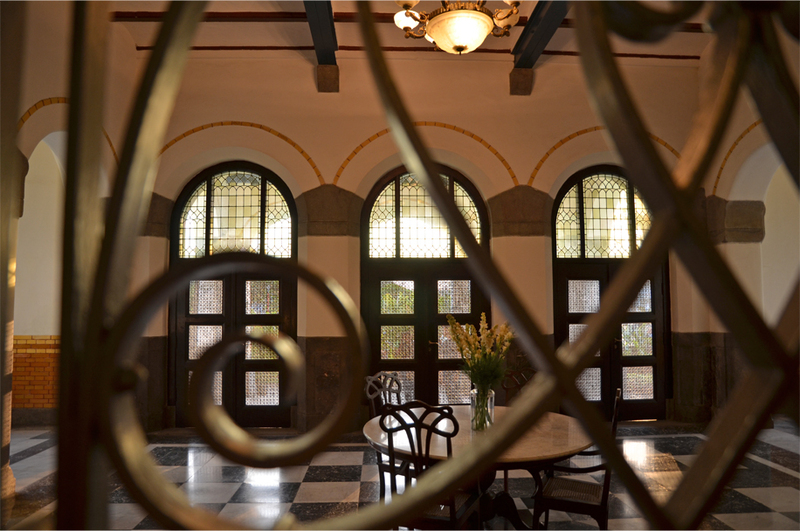 Yes, I saw at least three cafes/restaurants inside some beautifully restored buildings. Spiegel – just across the park from Gereja Blenduk – is apparently the place to be for an evening drink. Fingers crossed I’ll try it out the next time I visit. A slice of Holland in Java ~ a great way to spend a Sunday morning…to experience more of the magic you have traveled and experience. 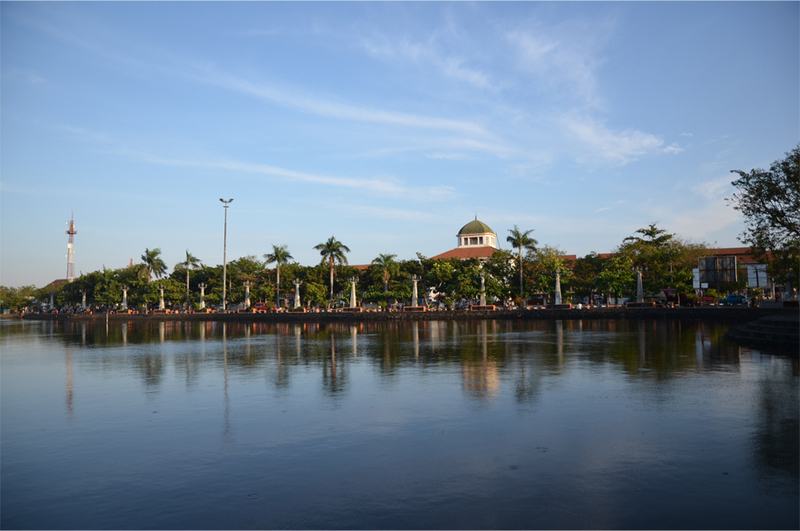 Semarang through your words and photos ~ thank you. You’re welcome, Randall. Semarang is such a photogenic place – I’ve often thought about returning to shoot and gather material for a future travel story. Another great read, and I truly like reading the history of places like this. I don’t always like what the history was. But then, it’s all history isn’t it? The photo of the Tawang Reservoir is very cool. Well, they all are, but for some reason, I like that one. I went through Semarang, but honestly either, I just passed through, or I don’t remember much. So thanks! Thank you, Badfish. The reservoir was such a wonderful spot. You can just imagine sitting there and reading a book, or sipping an iced drink at an outdoor cafe if there was one. Judging by some of the previous comments, the old town must have been forgotten and decrepit when you passed through! Maybe we should open a cafe there by the reservoir!! Call it Ultra Badfish Cafe. I passed through the old town area so long ago, it was either decrepit (which I would have liked looking at) or I was too antsy to get to Bali?? Fascinating history James. The influence of the Dutch at the time seems considerable. The longer spell of British rule has obfuscated their limited presence in India. Your beautiful images of Lawang Sewu reminds me of the Railway offices in Yangon that are set to be transformed into a luxury hotel. The railways probably owned some of the best stretches of real estate in most South Asian countries! I suppose the Dutch influence in Indonesia is still palpable partially because they stayed in power for so long – it wasn’t until 1949 that they formally withdrew from the islands. 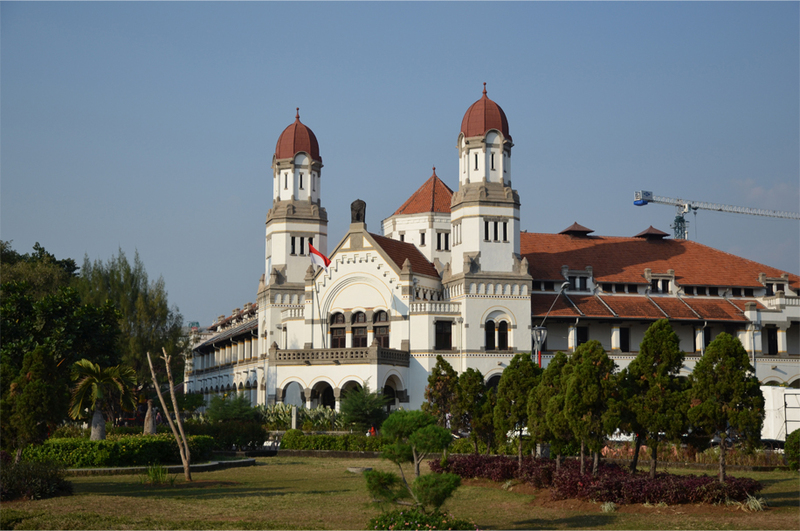 Lawang Sewu would make a fabulous heritage hotel but then it is believed to be very haunted! I think most are happy that the building is now a public museum and not a place for anyone to sleep.